Sir David Jason films the first series of Still Open All Hours in Doncaster last year. Filming for a second series of Still Open All Hours is due to get underway in Doncaster this morning after the BBC finally confirmed details of a new run of the show. Television crews have begun setting up in Balby this morning to film a second series of the cornershop sitcom. Fans have been waiting to hear if the show would return after a first series shown earlier this year proved a hit. The Beautique hairdressing salon on the corner of Lister Avenue and Scarth Avenue was transformed into Arkwright’s cluttered corner shop once more over the weekend with fans rushing to catch a glimpse. Stars such as Sir David Jason, Lynda Baron, Johnny Vegas and Tim Healy are all due on set over the coming days to film outdoor sequences over the next two weeks. The first series, which featured comic legend Sir David reprising his role as Granville, was filmed for two weeks last September and aired over Christmas and the New Year. Meanwhile, the BBC yesterday finally confirmed rumours announcing the show’s return. The series will start with a Christmas special where Granville bags himself a bargain Christmas tree, which gives him more problems than he wanted. Eric (Johnny Vegas) and Cyril (Kulvinder Ghir) embark on a new fitness regime and, as the holidays approach, Granville and Leroy (James Baxter) try to entice Madge (Brigit Forsyth) to their festive party. Also returning to the new series is Tim Healy as love-stuck Gastric, Nina Wadia as town gossip Mrs Hussein, as well as original cast members Lynda Baron as Nurse Gladys Emmanuel, Stephanie Cole as The Black Widow and Maggie Ollerenshaw as the object of Granville’s affections, Mavis. 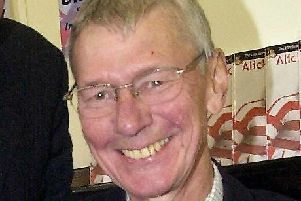 Written by Doncaster-based scriptwriter Clarke, the comedy was given a full series after a one-off special in 2013 proved the biggest show of that year’s Christmas schedules. The six-part series, which focuses on life at the cluttered corner shop nearly thirty years on from the last episode of original show Open All Hours in 1985, also proved a smash. The original aired between 1973 and 1985 and featured late comedy star Ronnie Barker as stuttering, penny-pinching Arkwright with Jason playing put-upon assistant Granville. It was voted one of the best sitcoms of all time in a BBC poll.